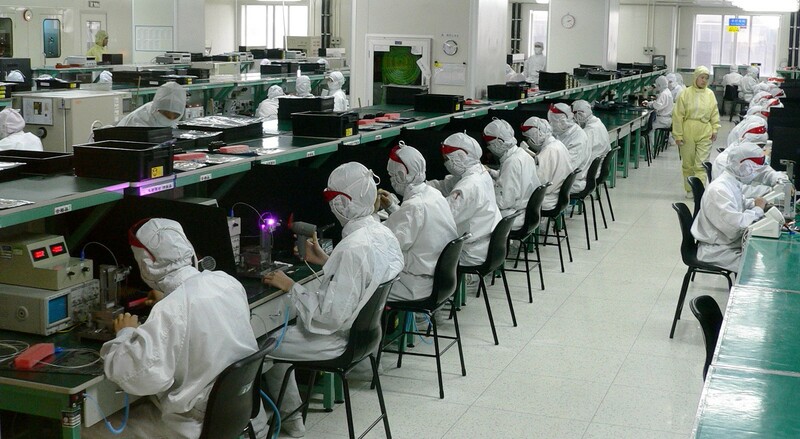 A recent publication of the European Trade Union Institute finds that electronics firms in Europe often get away with employment practices resembling those in mainland China. This evolution has an impact on working rights and conditions of European workers employed in the electronics sector, especially in Eastern Europe. 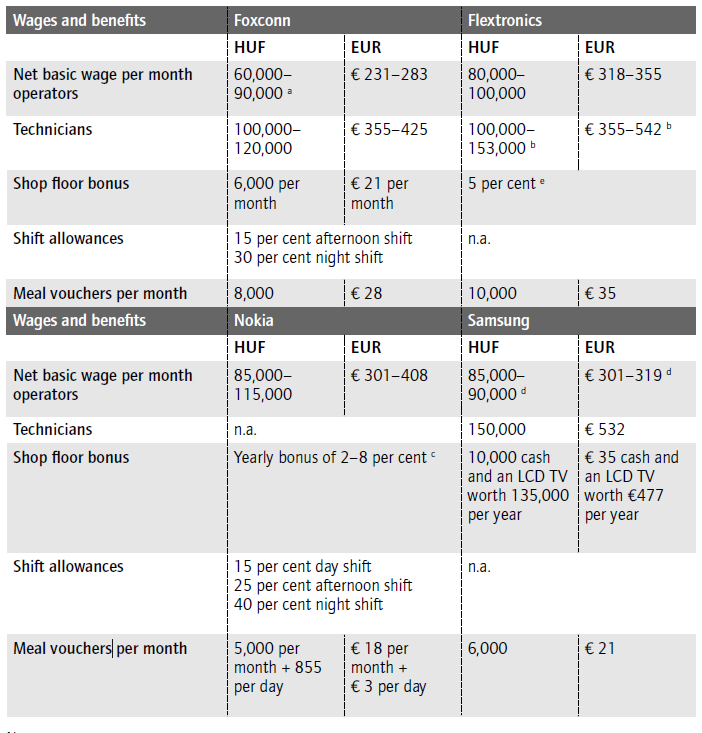 In Hungary, the average income of a worker in the electronics sector is living wage of 83,941 HUF (294 EUR) or slightly higher and the net basic wages for unskilled workers are lower than the average net monthly earnings of a manual worker in the manufacturing sector in Hungary (381 EUR). On average, temporary workers in electronics firms vary from 15 to 50 or even 60 per cent. Because agency workers at Foxconn do not work full time (70 per cent), they receive a wage that is on average 10,000 HUF less than that of their permanent colleagues. Agency workers spend a proportionally higher amount of their wages on transport if they work only part-time (70 per cent) at Foxconn, which most of them do. Furthermore, the system in Hungary also allows workers to do 12 hours shifts, with on average 40 minutes for an 8-hour shift. The most common problems were dizziness, back-aches, tiredness and problems related to rhythm changes between day and night shifts. Workers complained (also in internet blogs) about shouting, the use of inappropriate language and threats of dismissal and disciplinary warnings. At Samsung there were also complaints about the strict work discipline and the fact that talking was not allowed during production work. In Czechia, the study found that Foxconn has used the strategy of externalising a substantial part of the workforce by contracting temporary work agencies. The indirect workforce, mostly migrant workers, constructed as an ideal workforce has ranged from 30 to 50 per cent of total manual workers. Temporary work agencies were found not providing social or health insurance (or provide falsified health insurance cards), not respecting holidays, delaying the payment of maternity benefits, threatening workers, partly paying envelope wages or asking workers to sign an agreement on the termination of the work contract at the very beginning of the contract. In addition to this, workers are subjected to three shifts of 11.5 hours, combined with the work accounts. The work organisation and employment relations in Foxconn’s Chinese operations are characterised by military discipline and ideology, task simplification and intensive work combining the production and reproduction of labour power in huge industrial compounds. As a result, the electronics sector also in Europe is characterised by the proliferation of anti-union practices and the destruction of effective labour voice. 7th of October is the World Day for Decent Work (WDDW). This is a day for mobilisation all over the world: one day when all the trade unions in the world stand up for decent work. This piece is intended to shed light on working conditions and worker’s rights in the electronics sector in Eastern Europe on the basis of a recent ETUI publication “Flexible workforces and low profit margins: electronics assembly between Europe and China”. Have you read and/or seen? Multinational corporations: what does the ETUI do?